Mommy Tots: Ballet Manila Presents Severino Reyes' ~ “Tatlong Kuwento ni Lola Basyang: A perfect weekend treat for the whole family! Ballet Manila Presents Severino Reyes' ~ “Tatlong Kuwento ni Lola Basyang: A perfect weekend treat for the whole family! “From Page to Stage,” Ballet Manila’s (BM) 20th performance season begins on August 21 with Severino Reyes’ “Tatlong Kuwento ni Lola Basyang,” three captivating dance productions of love, fantasy and adventure. Lola Basyang was the pen name of Severino Reyes the former editor of the famous Tagalog magazine Liwayway back in 1925. In between running the publication he penned enchanting tales about magical kingdoms and strange creatures. The stories were published in a section called "Kuwento ni Lola Basyang." Reyes wrote over 400 well-loved tales and generated a huge following among magazine readers. Apart from the magical twists, the stories impart heart-tugging lessons on good morals and values which appeal to both to children and adults.Ballet Manila brings back the storybook magic of “Ang Prinsipe ng Mga Ibon,” “Ang Kapatid ng Tatlong Marya” and "Ang Mahiwagang Biyulin” on its 20th performance season. Ballet Manila Chief Executive Officer and Artistic Director Lisa Macuja-Elizalde choregraphed “Ang Kapatid ng Tatlong Marya”. Set to the music of Joey Ayala, it tells the story a boy in search of his three sisters who were captured by a beast, as a punishment for their father's greedy streak. The boy strives to fulfill their father's dying wish by coming face to face with the monster that took his sisters. For the choreography of “Ang Kapatid ng Tatlong Marya”, Lisa was immediately moved by the children’s book published by Anvil Publishing, a re-telling of the Severino Reyes story by Christine Bellen, with illustrations by Frances Alcaraz. The music of Joey Ayala further immersed her creative mind allowing her to recreate the story as a dance sequence. She enjoyed creating the family scene, describing it as the most “classical” of all sections. “ I had fun doing the solo variations of the three Marias and the family dance. I love the snake and tree scene because it is so unexpected and dramatic. I also like it when the live animals are pushed onstage, again because it gives an unusual touch to the ballet,” she shared. Tatlong Kuwento ni Lola Basyang promises to be the perfect weekend treat for the whole family. “The kids will like the snake scene and all the live animals on stage. I also tried to be as "storyteller" as possible - I wanted the scenes and story to be briskly told. Pacing is key. The trilogy is a good experience that needs to be shared by the whole family.” she said. 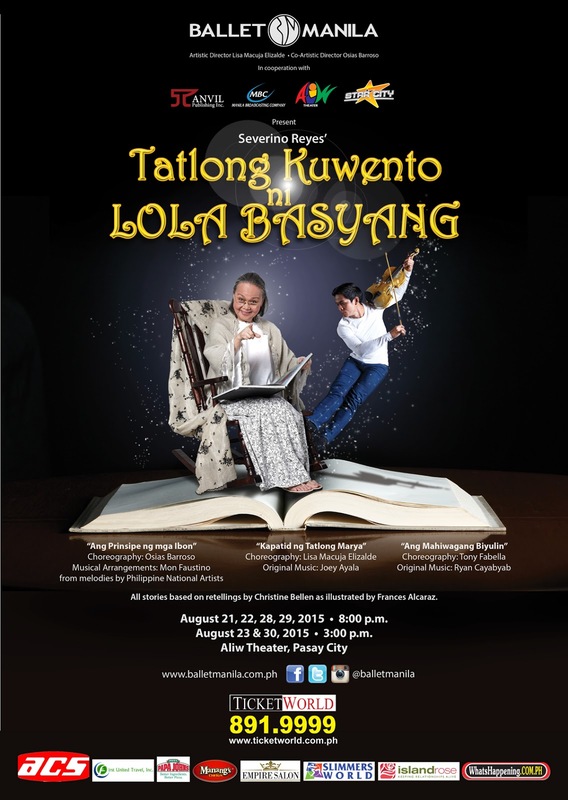 “Severino Reyes’ ‘Tatlong Kuwento ni Lola Basyang’” goes onstage at Aliw Theater on August 21, 22, 28, and 29, at 8:00 p.m., and on August 23 & 30 at 3:00 p.m. Sounds fun! Always wanted to hear and experience Lola Bashang's stories. This is a nice show to watch, I know my kids will love this. Would love my kids to see this show. I remember reading stories of Lola Basyang, when I was younger . It would be nice to reminisce. I myself would love to see this. Batang isip minsan, haha. How I wish I have a sitter to take care of my little one for me to watch this! Lola Basyang! I'm sure this will be a fun-filled educational experience for both young ones and the young at heart. It would be nice to see Lola Basyang on stage and to expose our kids to her stories that we grew up with. I hope there will be a re-run.